My personal style changes pretty often depending on my mood & the weather, however, I rarely inject boho vibes into my outfits. I usually prefer more structured pieces opposed to free & flowing, but, this kimono was so much fun to photograph! The bright floral print & the unique fringe sleeves blowing in the wind were a blast! If you don't have a kimono in your closet, I highly suggest grabbing one! A kimono is perfect for days when you want to add a little extra something to your look. A fun kimono gives jeans & a basic tee shirt a whole new life! Thank you! it's such a fun piece! I love the colors in that. Is it spring yet? Also, your hair looks great! I feel the same way! Counting down the days to warmer weather! This looks amazing! Love that print ;) Looks stunning on you. Thank you! Isn't it pretty? Lovely kimono! The print is fabulous. I just love everything you wear! This is so fun and totally makes me ready for spring. I love that fashion allows us to change up our looks depending on our mood. I am totally with you! it was so fun to try out a different type of look! Wow this is SO fun! I love it! Thanks! It really is a fun piece! I am so loving the fringe girl. You look great. I absolutely LOVE your kimono! Great look! That is such a cute kimono! Love the way you styled it! Thanks! I really wear boho looks, so this one was super fun! I adore this look! The boots are especially my favorite! I love you kimono! I borrowed one from my mom last time I was home and loved it! What a great idea to test out a trend - borrow a piece! Such a warm color and fun piece, I LOVE it. This post reminds me that I have a pair of suede fringe boots collecting dust in my closet. Hummm! May be time to pull them out! Great post and great outfit. Love them. I fllow you on GFC, g+, instagram, could you follow back, pls. Kiss, dear. That floral kimono is gorgeous on you! I love that you paired it with the fringe boots too. So cute! Loving fringe! Fab fun look! I'm so glad you like what you see! Thank you! The floral pattern is my favorite! Isn't it? I was pleasantly surprised when I got it in person! Super cute! 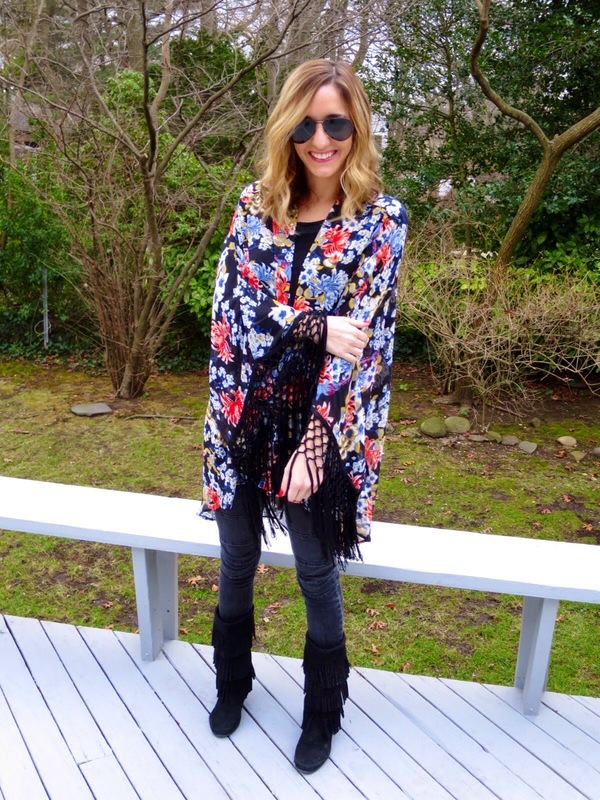 I love the double play on fringe with the boots! 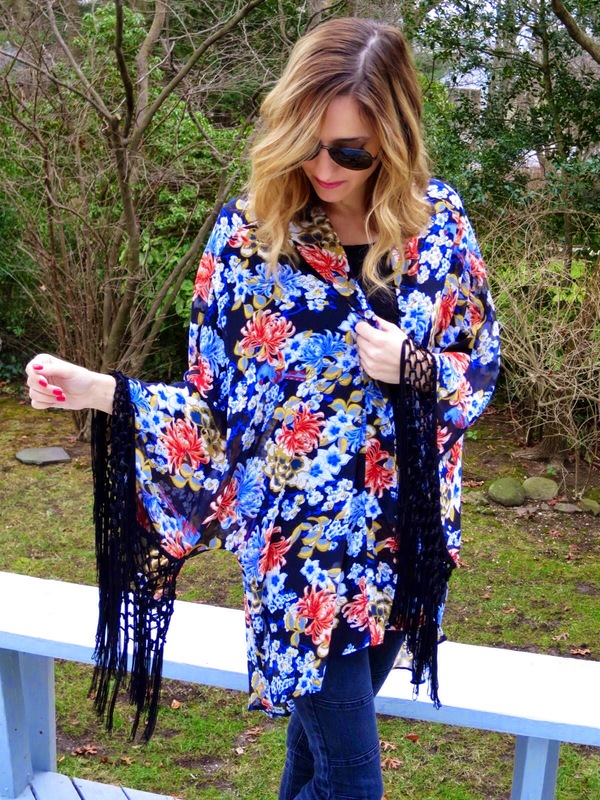 Funny, I literally just purchased a kimono (with fringe) today right before I saw this post! Ahh! You are so right, it totally can channel that hippie/boho vibe, but at the same time, totally dress up plain tee and jeans. 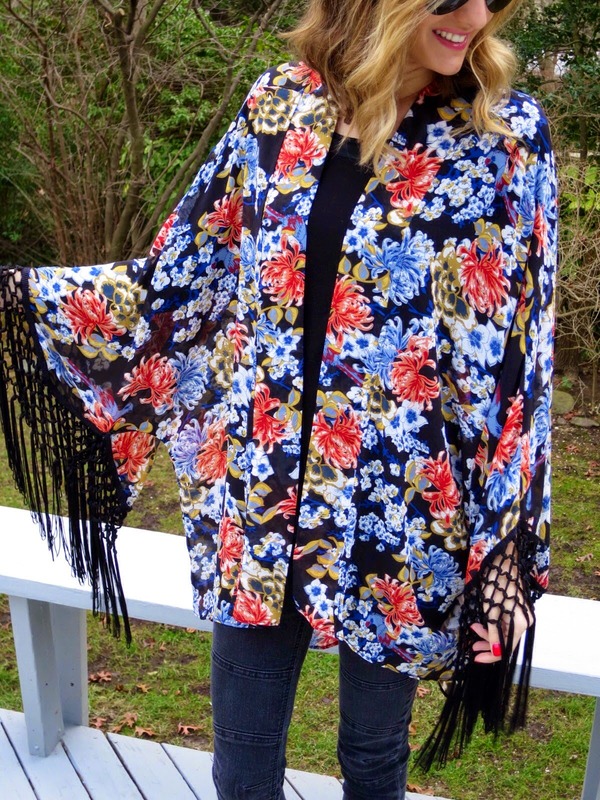 I am addicted to my kimono already, and have fallen in love with yours too!! That is awesome! I would love to see how you style yours! That shawl is everything...I love the colors! Me too ! The fun floral print is what first attracted me to it! 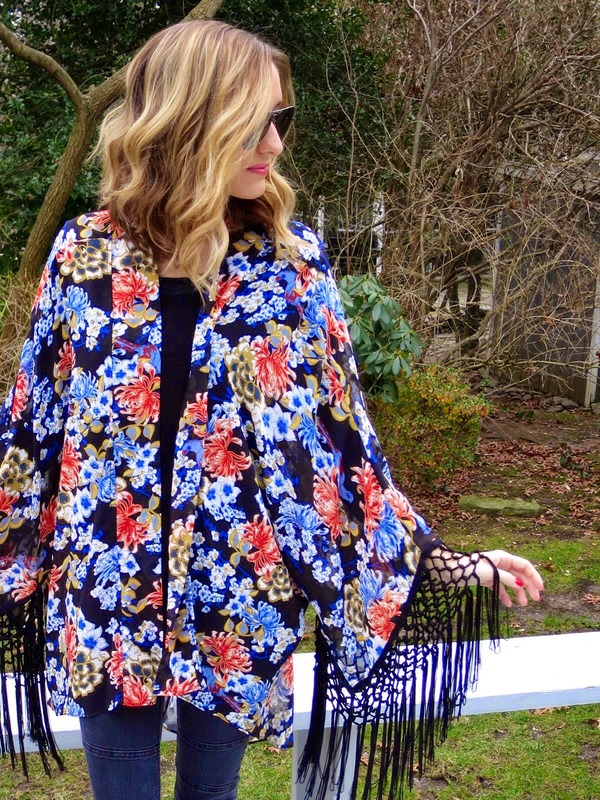 I'm really into fringe right now so I'm obsessed with your beautiful kimono!! You look so pretty. Thank you! It's such a fun texture to wear! 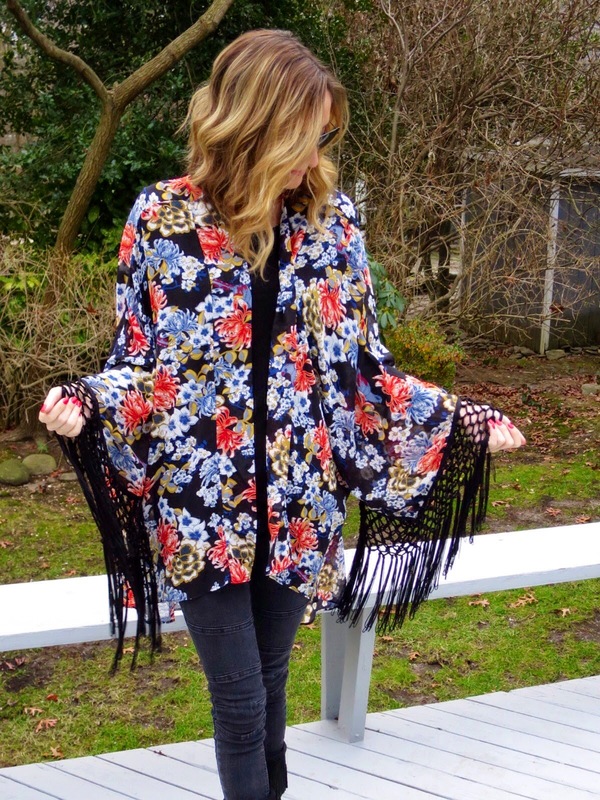 This kimono is gorgeous, love the fun fringes! So glad I found your blog through the linkup! Yay - thanks so much for visiting!